Today’s Nice Price or Crack Pipe M3 has a lot of miles under it’s belt. We’ll have to see if that means that its price puts it under water. The 1986 Ford Thunderbird we featured yesterday took home a narrow, but decisive 53% Crack Pipe loss for its eighty-five hundred dollar price. That was despite the presence of a lukewarm Five-Point-Oh mated to a five speed stick. So many fives! If only its price could have engendered a high five, the results may have been different. Do you recall an article couple of weeks ago bemoaning the durability of hot BMW engines? It may not have been a popular opinion, and oh boy did it engender some healthy gainsay in the comments, but a well supported opinion it was. Here to offer perhaps a final rebuttal is this 1998 BMW M3, which rocks an S52B32 DOHC straight six, good from the factory for 240-bhp and 236 lb-ft of torque. It would be interesting to see how many of those ponies are still in the corral now however, as this car has a claimed 348,000 miles on the clock. Let me repeat that, this Bimmer has travelled three-hundred and forty eight thousand miles. That’s a trip to the moon and half way back at perigee, which is about all you’d get seeing how few filling stations there are up there. I know, holy cannoli that’s a lot of miles. It’s even more if you convert it to kilometers. That being said, this car has no right looking as good as it does for having travelled so far. Hell, I look pretty worn out just going to the store and back. I should probably work out more. This car seems to have worked out, and there doesn’t seem to be any indication in the car’s mechanical function, or much in its aesthetics, to fully indicate the lengths to which it has gone. Let’s talk about those mechanicals first. That S52 isn’t the twitchy time bomb that Europe received in the E36 M3. This engine has a single VANOS and lower output, and the U.S. cars received a five-speed manual while Europe got a six-speed to play with. That’s a VANOS you don’t have to worry about blowing up and one less synchro to go bad, so win win, right? This is said to have been a one-owner car and that owner racked up $30K in receipts over the course of the relationship. The ad notes the notable additions of a UUC short shifter, Bilstein shocks, a cat-back exhaust and a carbon fiber hood. That hood sets off against the car’s current wrap which is bright fluorescent orange. That makes the car look like either the Great Pumpkin (all hail the Great Pumpkin) or a traffic cone. It’s a lot more eye searing than that Kermit-green Audi we saw over the weekend, but probably easier to pick out in a crowded lot for it. That wrap is un-wrappable but there’s no word on the shape of the Alpine White (?) paint beneath. Everything else, aero-aids, badging, black-painted Contours, seems intact. The interior seems to belie the mileage too. Oh sure the off-side bolster of the driver’s sport seat shows a good bit of dye transfer from wear, but it’s amazingly not broken through. The rest of the interior, from the dash to the door cards looks to be in great shape. The seller says that everything is functional, right down to digital displays. Amazing! Okay, so BMW M-series engines may not have the long-term rep of, oh say the Curiosity Rover, but this one seems to have dodged not just a bullet when it comes to durability but a whole fusillade of rounds. The question is, has it just been biding its time until a new owner takes over and decides to practice some different ownership habits? You’ll have to take that into account when you consider this M3’s $3,900 price tag. On one hand you have a car that seems to have been well taken care of and well-enjoyed. On the other, it’s a pretty complicated car that’s done the equivalent of nearly 700 Indy 500 races. What do you think, does this screaming orange zonker seem worth that $3,900 price (apparently reduced from $5500)? 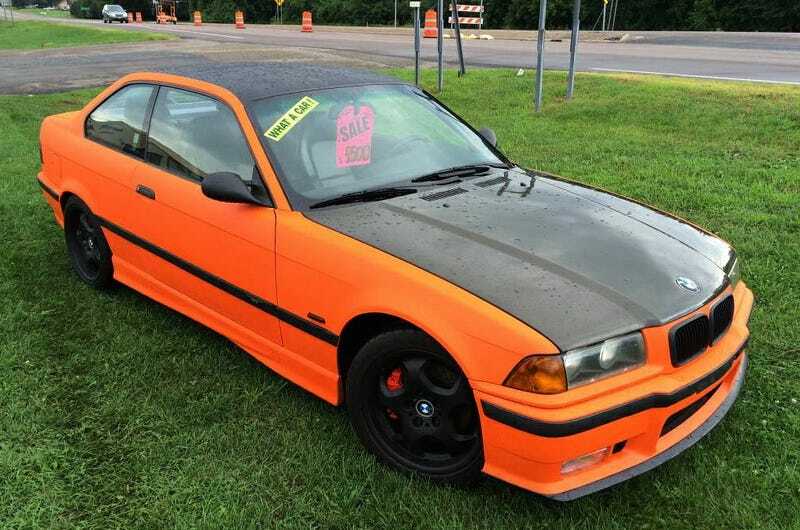 Or, should the miles add up to a lower price for this used Bimmer? H/T to harrymurphellino for the hookup!